On Wednesday, Apple introduced the iPad Pro, a tablet with a much larger (12.9-inch) touch screen than previous iPads, in addition to revealing a new optional stylus and physical keyboard/cover. It's almost like Apple is taking a cue from the Microsoft Surface and trying to bridge the gap between traditional laptop computers and tablets — a market it legitimized with the first iPad back in 2010. Apple even invited a Microsoft exec on stage for the first time ever to show off how Office works on the iPad Pro. This chart shows why. 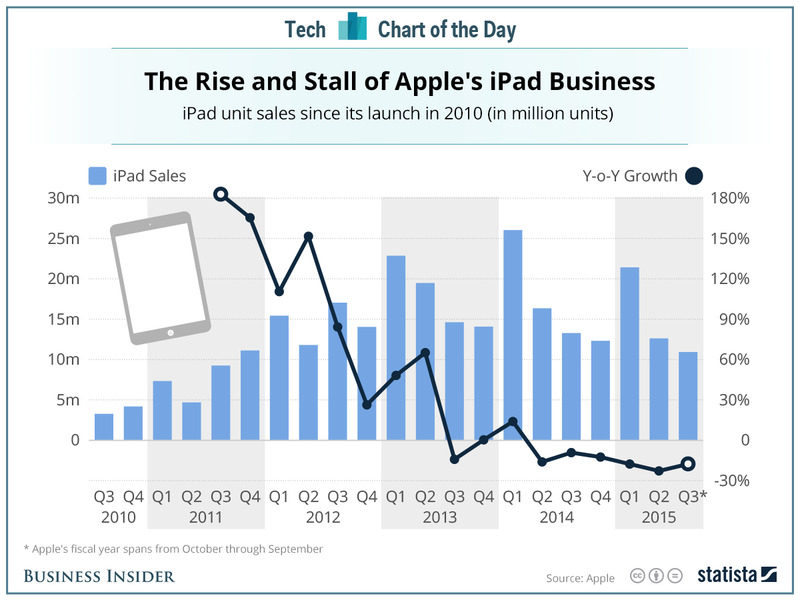 iPad sales have been shrinking on an annualized basis for the last six quarters, according to this chart compiled by Statista from Apple earnings reports. Apple is making a big push for the iPad in the enterprise space, using partnerships with IBM and other software providers to target big companies and government agencies. But that's Microsoft's stronghold, and it's going to face particularly strong competition from Windows computers — including the Surface Pro. With the iPad Pro, Apple takes another shot at giving companies what they really want — a touch screen computer where you can do real work. What we found startling was how a Microsoft Executive was brought on stage to reflect upon the interoperability. There is also the iPhone "incremental" upgrade along with AppleTV which we will have our own take on it as we continue to assess the 2-Hour Keynote and the subsequent post-analysis--some of the highlights we have released in our Twitter Feed as part of our daily #techwatch hashtag on the "Grid".